Was a fun movie with great songs by ABBA. (The person that said in their review that there was too much ABBA music is a real dumbass! 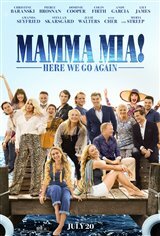 It IS an ABBA-written musical and you must have been living under a rock since the musicals debut years ago,) The plot was too jumpy and hard to follow, who was married to whom, who's dead/alive, who's that character and what involvement in the plot, which made it tedious to watch at times. Cher was her usually campy self in her cameo and her one liner zinger "That's what grandmother's do, little girl!" was priceless. Cher can be my granny any day! A cute not great film, a great evening out, and you don't need to think about what's going on, just enjoy it. This is a pretty bad movie. How could it have gotten any good reviews? From the horrid opening "number" you get a feeling you wasted your money, something that is confirmed by the even sillier ending with Maryl Steep as ...a painting over the new inn's fireplace (!) ...and then a ghost at a wedding? Cher has to wear a cheap blond wig since she looks nothing like the petite blond daughter or granddaughter. Ex lovers arrive as if by a fleet? The scenery and some musical numbers are fun, but the story and acting is an embarrassment to all involved. It's casting location and storyline encourages family ties!!! Excellent...funny and heart warming! While the music was great, the plot was very poor. Caution..... this movie is addictive! It sounds like I am not the only one to have seen it more than once. And I enjoy it more each time. Probably go again very soon as I need a Happy Fix. I really loved the movie and like people say, if you are down in the dumps, this is a very good movie to see. It really lift your spirits and I keep on going to see it until it doesn't play in the theaters. I even pre-ordered the first and this one when it comes out on the DVD at the end of Match. Who wouldn't love this movie.